JNB-BFN flight bookings with SouthAfrica.TO qualify to earn travel vouchers - simply email cheapflights@southafrica.to a writeup of your flight and we'll send you some vouchers (pro tip: send photos for bigger vouchers). After Mango Airlines stopped flying the route, for a while SA Express had a monopoloy on Johannesburg to Bloemfontein flights. Fortunately there is now competition in the form of SA Airlink and FlyCemair. Flights are scheduled to take an hour, but to compare against driving you need to add in time at and driving to airports. In total perhaps 3 hours. Driving may take about 4.5 hours. Although there is also the matter of productivity lost as a result of not being able to work if you're the one behind the wheel. Intercity buses take about 6 hours. The driving distances is some 427km, and the shortest flight route about 380km. 16 Jan 2015 : FlyCemair will start flying from Bloemfontein to Johannesburg from the 23rd of February 2014. There will be two flights a day during the week and one flight a day during the weekend. 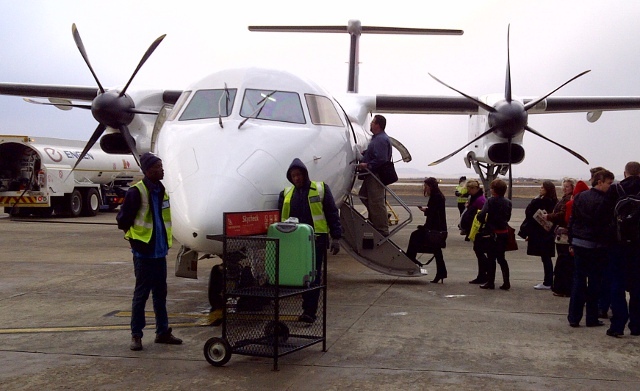 18 Nov 2013 : Airlink launches flights from Johannesburg to Bloemfontein. Flight SA8401 is scheduled to leave OR Tambo International Airport at 07h00 and arrive in Bloemfontein at 08h00, and flight SA8407 is scheduled to leave JNB at 17h20 and land in BFN at 18h20 (weekdays only). 19 Jul 2012 : Mango Airline quit flying from Joburg to Bloem. 12 Apr 2010 : Mango commences flights from JNB to BFN. In the last snapshot survey we carried out, SA Airlink was cheapest. The driving distance from Johannesburg to Bloemfontein is 427km from First Car Rental at O.R. Tambo International Airport to First Car Rental at Bram Fischer International Airport, taking about 4 and a half hours along the N1 National Road. Along the way you'd pass Orange Farm, Stretford, Evaton, Sebokeng, Vanderbijlpark, Kroonstad, Ventersburg, Willem Pretorius Nature Reserve, Winburg and Brandfort. "We landed on the bitterly cold landing strip (Ed: it was end July) in Bloemfontein and casually walked over to the main building, which has since the World cup in 2010, have been massively modernised." "I had to put this last photo is of our transport to Bloemfontein. A De Havilland Turboprop. It made me feel like an adventurer of old." Greyhound bus offers regular services from Johannesburg to Bloem, as does Intercape and Citiliner. The Intercity buses are scheduled to take some 6 hours. 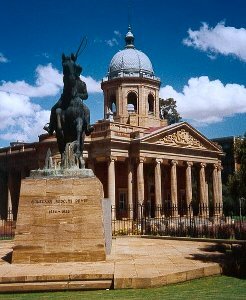 The buses leave from Park City Transit Centre at Johannesburg Station and arrive at the Tourist Centre in Bloemfontein, next to the Municipal Swimming Pool. There are regular Shosholoza Meyl train trips from Joburg to Bloemfontein. There are many hotels in Bloemfontein. Best rated by guests are the City Lodge, Dersley Manor and B&B At Bloem. You may also want to try the Palm Lodge or the Protea Hotel.